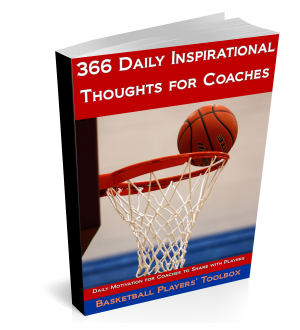 …Many kids today don’t understand that basketball is a we game – not a me game. They play for the scorebook, not the scoreboard. Am I allowed one more cliché? They play for the name on the back of their jersey instead of the name on the front. OK, I think 3 overused coaching clichés should suffice in getting my point across. This symptom is tricky… because it is actually an illusion. The players who think they are too good – actually aren’t! They aren’t anywhere close to being good enough, much less too good! They are so hypnotized by their ranking, or brainwashed by their entourage, that they won’t admit they have areas of their game that need improvement. They are too good to work on their left, too good to work on their footwork, or too good to work on their mid-range game. Who needs to be able to do those things when you can dribble between your legs 19 times in a row or dunk the ball with ease? Players that are too good are often shoot 1st, pass 2nd type players. Actually, they are usually shoot 1st, shoot 2nd, and don’t pass type players. They never bother with making those around them better. If a teammate can’t hold their own on the court… that is their problem. This symptom is complicated as well. I don’t know if I would go as far as to say that being too shy is selfish per se; but being shy does stunt improvement. You have to be assertive if you want to get better! You can’t be too shy to ask questions. You can’t be too shy to reach out and ask for help from your coach. You can’t be too shy to verbally communicate on offense and defense. Most kids aren’t shy when it comes to texting, Twitter, and Facebook… but they quickly go into a shell when expected to speak face to face.